Louie and I just got home from our second visit to Preston, CT and cousin Mike and Kathy’s farm. 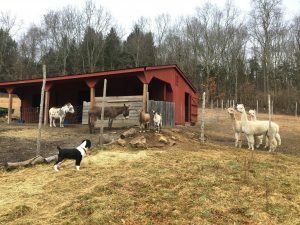 The first visit was back in December where Louie discovered dog heaven, with fields and wooded trails to run in, goats to chase, and donkeys and alpaca to investigate. 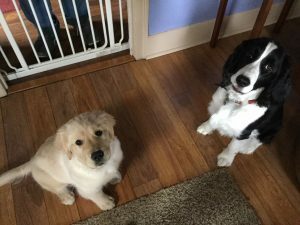 The second time, he met 14-week-old Tessa, the impossibly cute golden retriever puppy, the newest member of their family. 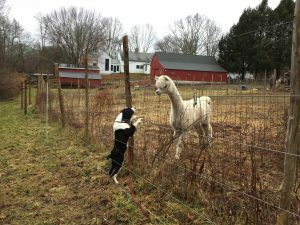 The goats and alpaca were still fascinating, but they couldn’t compete with a new puppy friend to play with. In December, after school was over for the holidays, I treated myself to a needed break from Michael’s shoulder and cardiac woes. The stress of the shoulder surgery and recovery must have taken a toll on his heart, because he slipped into A-fib and mostly stayed there despite numerous interventions. It was extremely frustrating and discouraging for him and me – many doctor appointments and trips to the hospital, none of which seemed to solve the problem. A short retreat where I could let someone take care of me was really restorative. Michael was fine home alone. Kathy made hearty soup, and baked delicious bread and cake, Mike and I took Louie for long walks in the woods, and Louie and I played in the fields as we watched the twice daily feeding of the animals. It felt comfortable and relaxing to be with family as we all played with Louie and talked about a wide range of topics. Louie also helped show Mike and Kathy how to puppy-proof their house as he stole accessible items he shouldn’t be allowed to have. In January the energy was a bit different. Mike was worn out from five weeks of new puppy parenting, and we held our breath as we watched the new friends rough-house with rolling, pinning, ear biting and growling. Tessa was not the least bit put off by her older, faster, heavier cousin Louie. 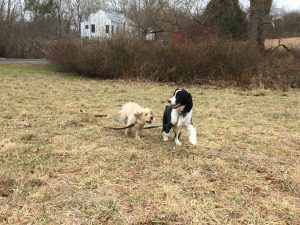 She seemed very outgoing and confident as she played with her first new dog friend. By the second day, they had settled down a bit and their playing was more gentle and sweet. We could let them play together while we ate delicious chili, more bread and cake, and enjoyed each other’s company. The puppies needed to be supervised while the other animals were being fed, not quite ready to let them both run around during that. Luckily the weather was cold and dry and the sticky mud all over everything was frozen. I look forward to coming back in the spring or summer. Both puppies will be so much bigger, but I know they will remember this wonderful first visit.